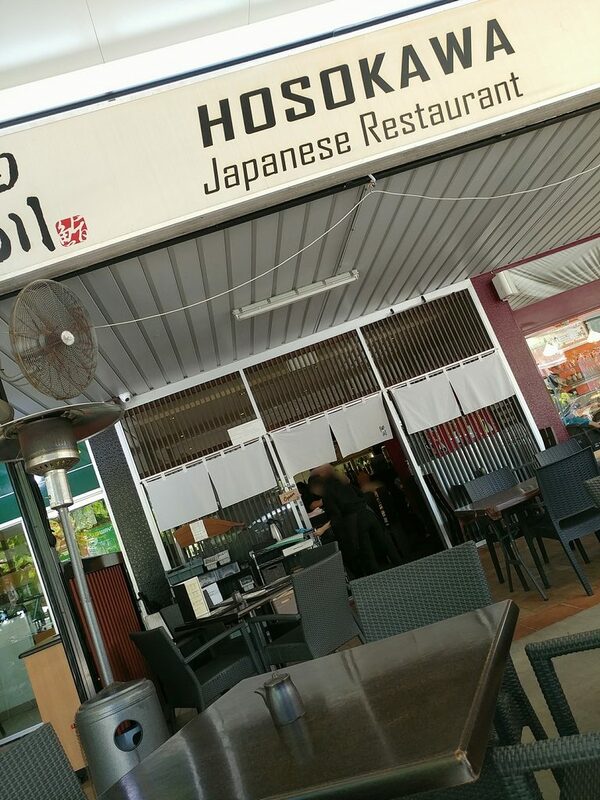 Hosokawa Japanese Restaurant has been a resident on Ascot’s Racecourse Road for many years. We used to frequent it when we lived closer by, but somehow had never gotten around to doing a post on it. Hosokawa has built up a solid reputation among locals for good, traditional Japanese food at a not exorbitant price, and we thought to revisit it one weekend afternoon (on a Saturday, as they are not open for lunch on Sundays) when we had a hankering for fish. 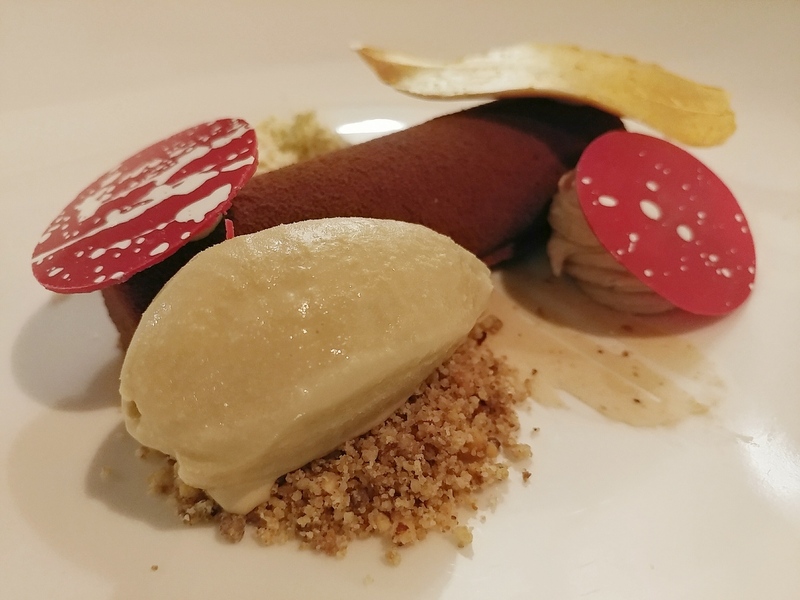 The restaurant was quite busy, and there was an “oh no” moment when they asked if we had a booking (we hadn’t planned that far ahead) and checked their reservations book, then compared that with the unoccupied tables. They found an available table, and brought menus as we made our way to it. The entrance to Hosokawa Japanese Restaurant, although you can’t actually see this from the street as it is screened off by drop shades. There is indoor seating and outdoor seating. The indoor area is air conditioned, and has quite classical Japanese styling, with noren curtains at the entrance, and simple cloth hangings on the walls. The seating is also more closely packed compared to the outside area, but it is air-conditioned. 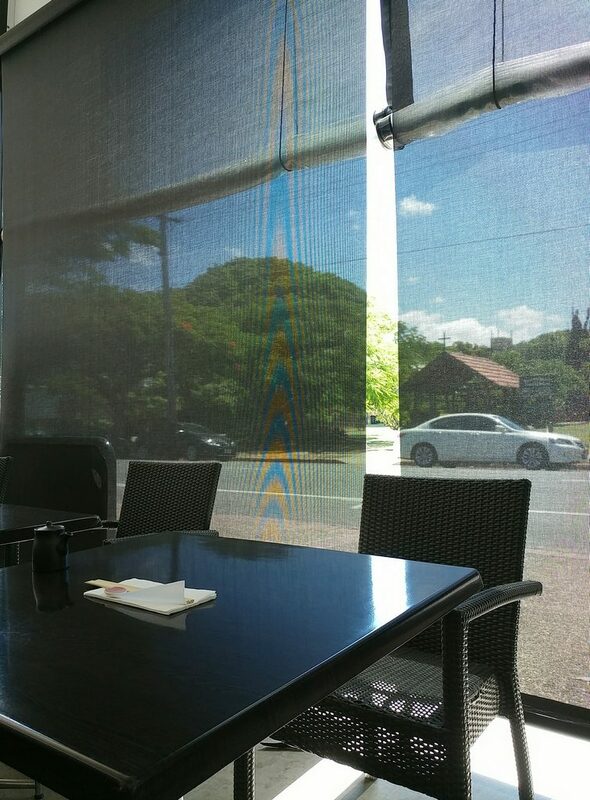 The outside area is covered, with darkening drop down blinds to provide shade when it gets too sunny. Oscillating fans move the air, which makes a noticeable difference in the heat. The tables and chairs, in dark colours and angular shapes, are suitably timeless in style. The chairs could be more comfortable, however, as they have a slight lean to them, so that you can sit fairly comfortably if all the way back in the seat, but then you will be far away from the table, or you can sit further forward to be able to reach your meal, but then find your legs pressed against the hard edge of the seat, so that it feels like circulation is being compromised. A couple of the tables in the outside seating area, and the screens that shade it from the sun. 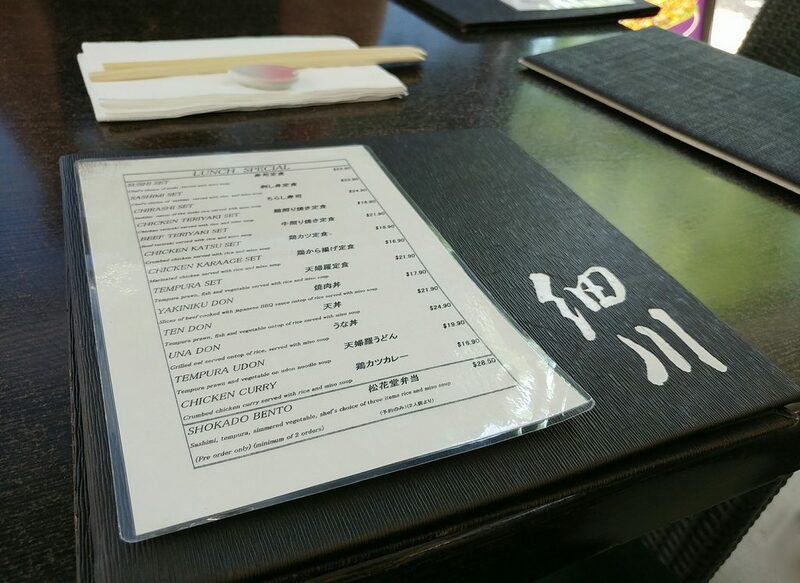 The menu is a black, hardcover book with pages of a range of typical Japanese dishes, including sushi, sashimi, soba and udon, fried items, and hot pots. 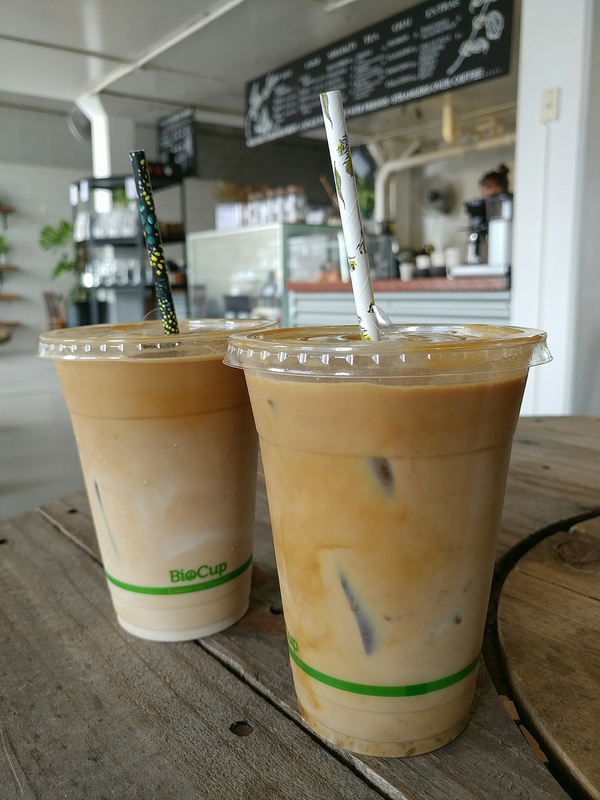 There is a separate menu of lunch specials printed on a single laminated sheet, and you will find that these are a good deal indeed. 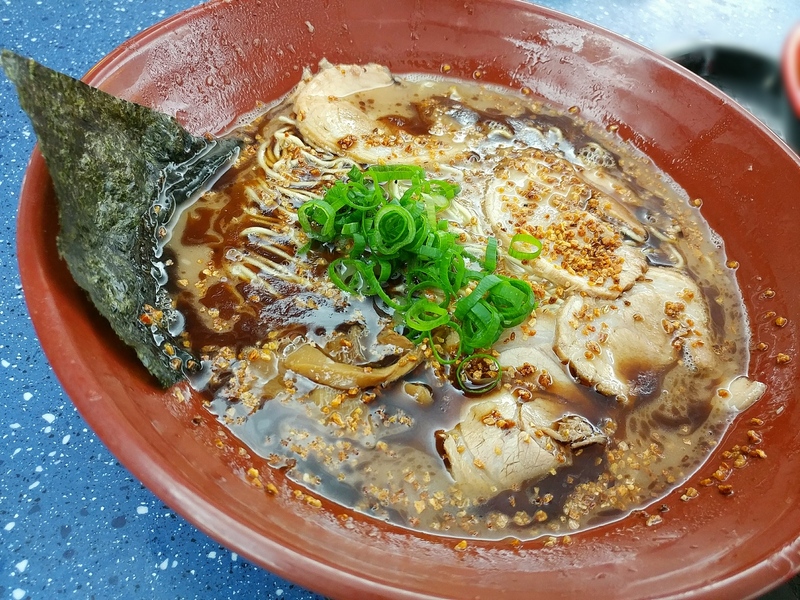 This has set meal options of popular casual Japanese dishes like Beef teriyaki , Chicken karaage, or Una don. We both picked the Chirashi set, which we had had before and liked. The regular menu, and the special lunch menu. 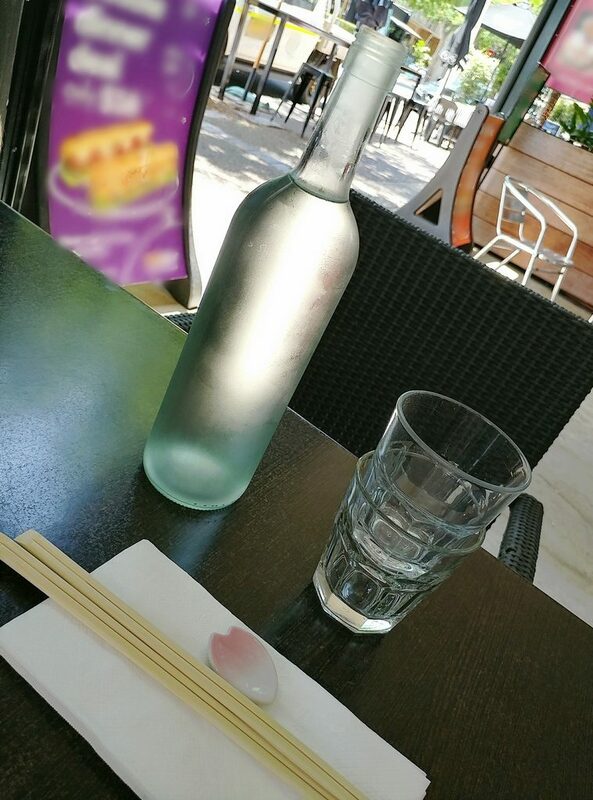 Glasses and a bottle of cold water were brought to the table. Particularly on a warm day, this was better than having just room temperature water. Chilled water was just right. Despite there being many other tables, it was not too long before the food was brought out. 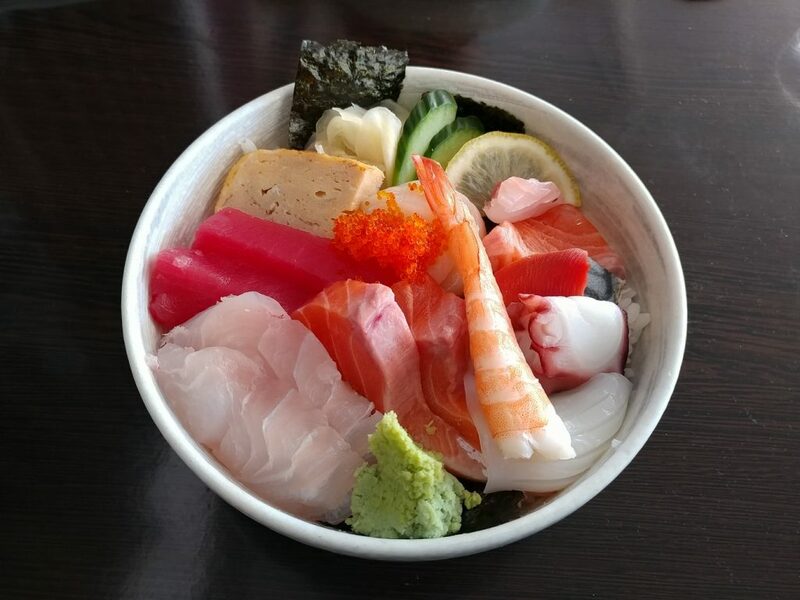 Chirashi consists of slices of sashimi on a bed of sushi rice. It is usually (but not always) a good way to get a range of seafood, at a better price than the same in nigiri form. 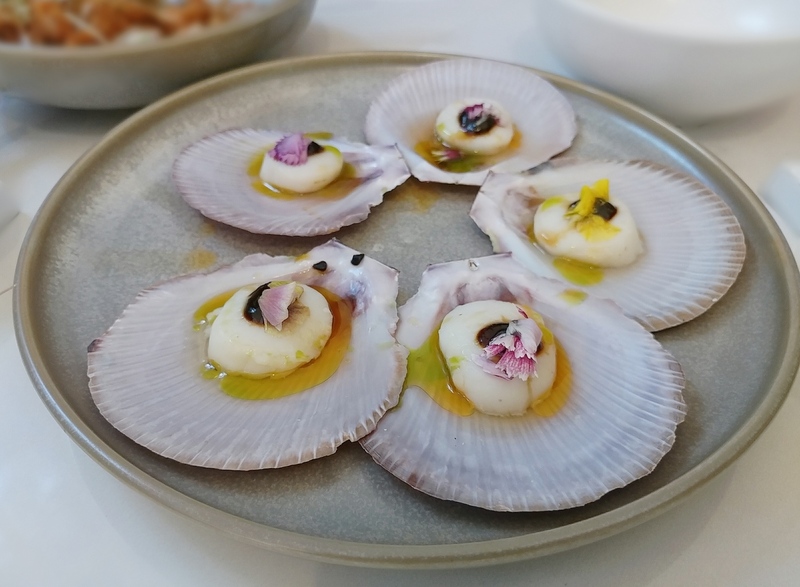 You don’t get to specify which seafood you get, and you may get different things depending on what the chef has available. Here, the Chirashi bowls were colourful and had a good variety of components. 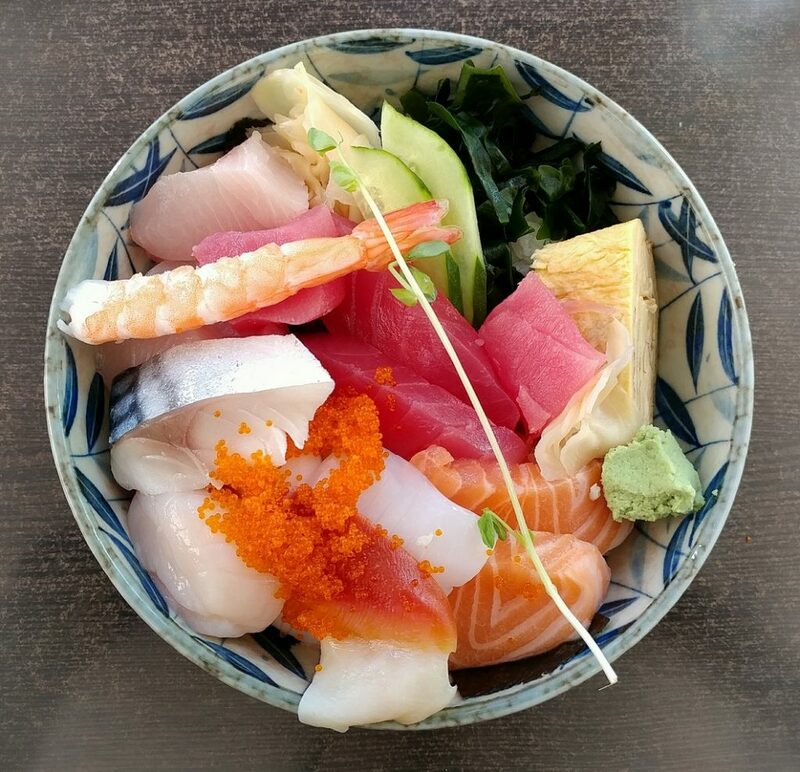 The Chirashi bowl from above. 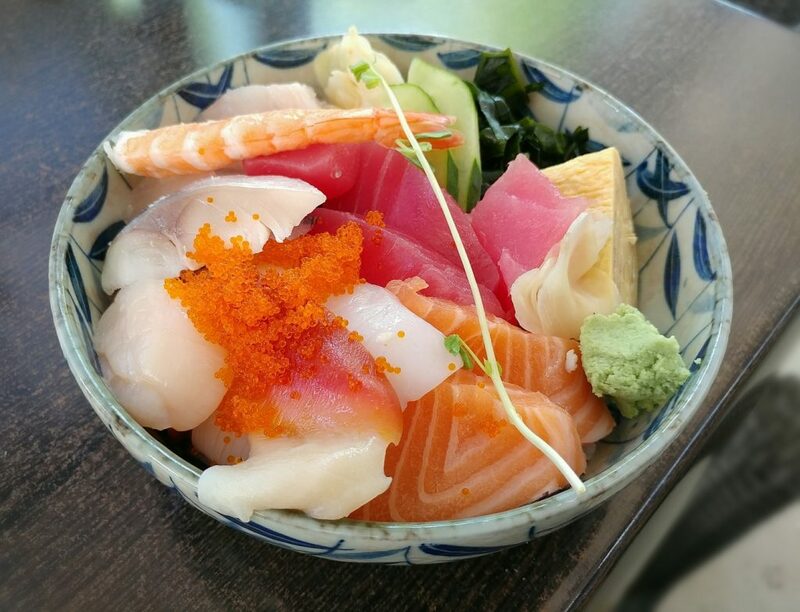 The sashimi slices in the chirashi bowl were fresh, with a selection of the fish people would typically expect when they have sashimi. 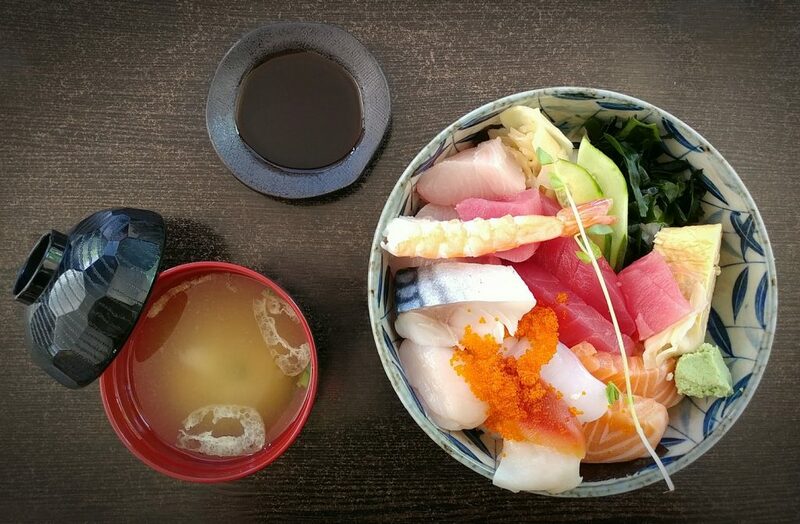 In the bowl were slices of salmon, tuna, yellowtail, Japanese mackerel, surf clam, octopus, and a plump scallop. There were also slices of cucumber, kelp, and zingy pickled ginger, as well as a piece of tamagoyaki. The tamagoyaki had a neutral, rather than sweetened flavour. A clump of tobiko was scattered on top. The sushi rice forming the base was sticky, so easy to pick up with the chopsticks, and slightly vinegared. 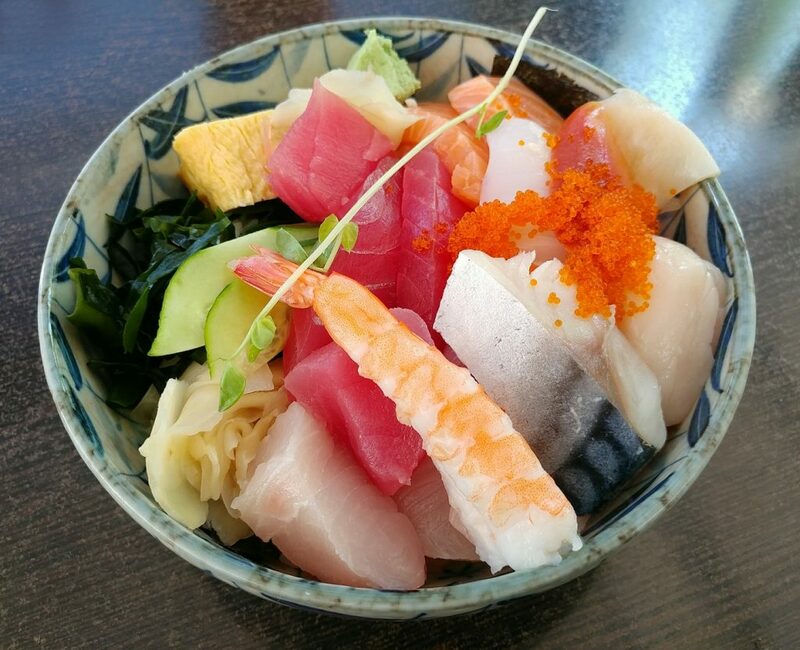 A closer look at the ingredients in the chirashi bowl. The chirashi bowl from another side. 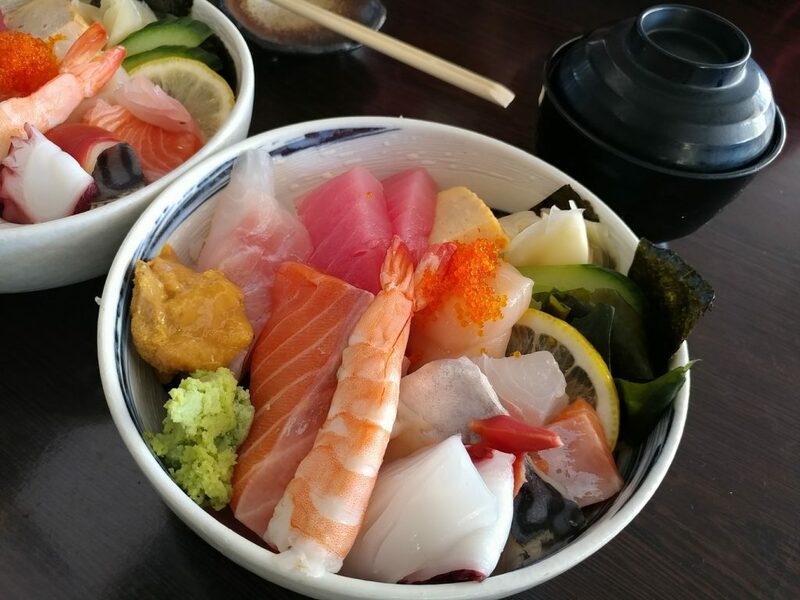 It compared quite well with the chirashi bowls we had had from them before, although the cuts of sashimi used to be a little more generous. A real sushi connoisseur might find fault with the inconsistency of their cuts, as even between our two bowls, there were noticeable differences in thickness and sizes of the same sashimi components. Still, if one were to want to be exacting about proportions, then one should order nigiri for a proper test. Chirashi bowls we had had at Hosokawa about two years ago, for comparison. We had uni added for slightly more, as it was in season. The older chirashi bowl again, for comparison. The Chirashi set (as did the other lunch sets) came with a bowl of miso soup. This was piping hot and pleasantly savoury. It had slices of fried tofu floating on top, and cubes of soft tofu submerged in the broth, along with pieces of kelp. It would make a great winter warmer, although in the hot weather, we had to leave it for a bit so that it was a little cooler (hot soup in summer can be just a little much). The miso soup, wth tofu floating on the surface. 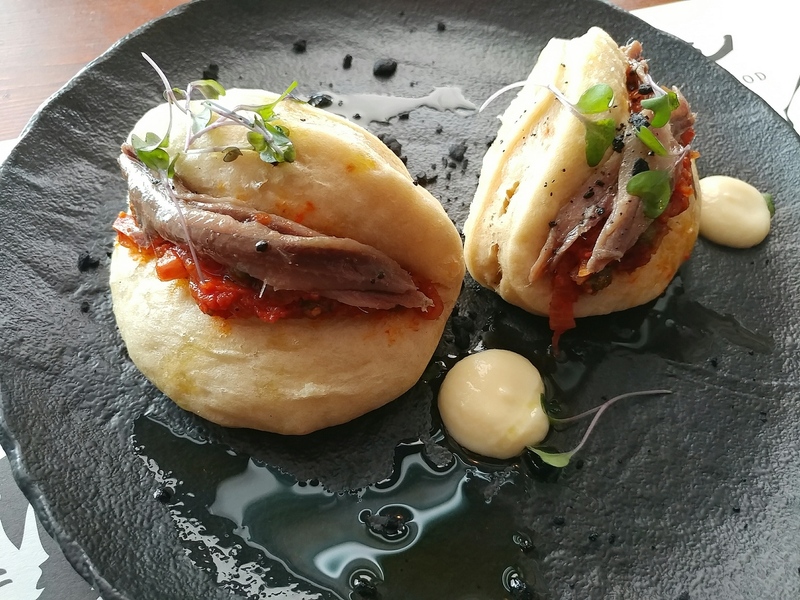 Overall, we found that Hosokawa Japanese Restaurant has stood the test of time. 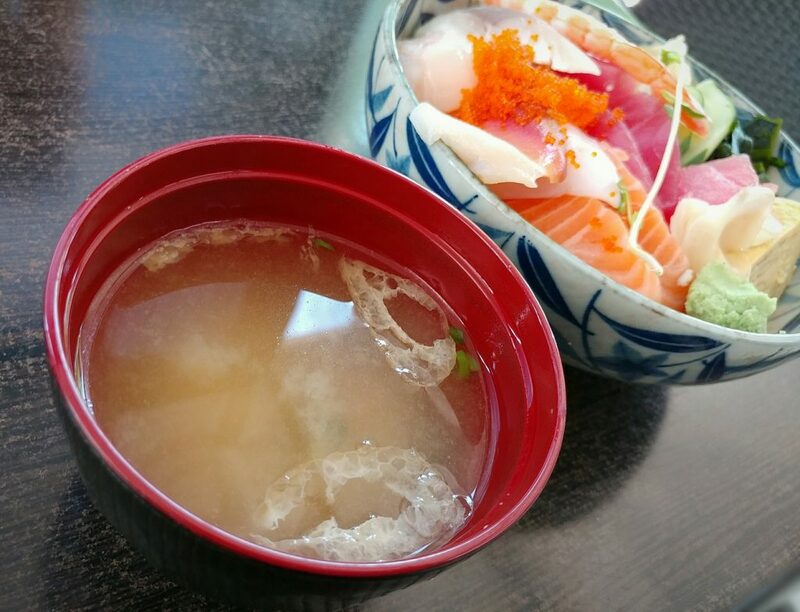 The lunch sets are good value, and the chirashi in particular is good bang for buck. Note though, that it is not available at dinner time. This is good Japanese food that fits comfortably between casual cafe and high end restaurant. 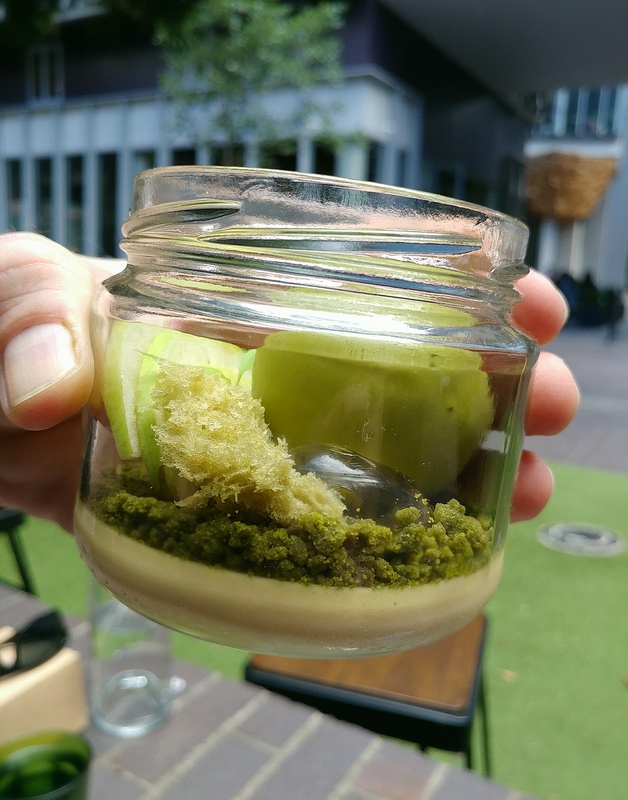 If you are a fan of Japanese food, this is worth checking out. The chirashi set you know you want to get. Price point: Lunch menu items $16.90 to $24.90. Chirashi set $24.90. Value: Good for the lunch sets.